You are at:Home»Blog-News U can Use»More Buy-In Required!! For the last three weeks, we’ve been having a conversation around the difference between Strategic Sourcing and Category Management? This is a topic that got LOTS of attention and quite a bit of engagement from the readers of this blog 🙂 ! 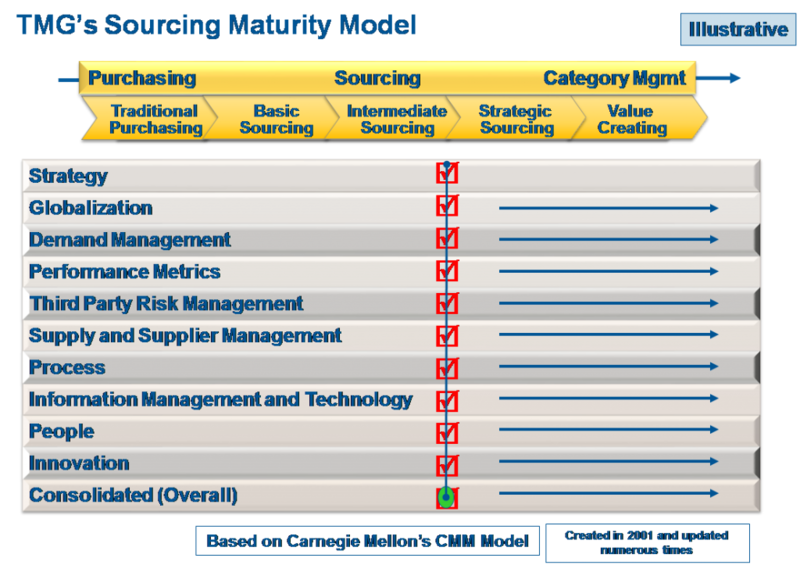 Stay tuned as we walk through the other elements of our Sourcing Maturity model in the coming weeks to continue to explore this highly controversial topic . . .
How much time do you spend with the senior leaders in the business unit under which your “category” resides? How much time do you spend with the Suppliers/ supply base within your “category”? The answer to both questions needs to indicate that there is a collaborative relationship whereby you are deeply involved in the day to day business of your internal business partner AND you are spending enough time with your suppliers to explore ways to grow both of your businesses. When I hear “we have quarterly update / status meetings” I know that we are not speaking the same language. To me, the biggest difference between Strategic Sourcing and Category Management is an increased level of engagement on the front end (and throughout the entire process) in developing a category strategy that aligns with the strategy of your business units and drives value (that is defined by them) to meet their business needs AND increased engagement and collaboration on the back end with the supply base to increase innovation and extract mutual value from the relationship that goes way beyond the contract. If that does not sound easy, it’s because it is NOT. It requires the Procurement organization to play a role that it may not necessarily be comfortable with- the role of a trusted advisor. If there is a secret sauce for your organization in increasing your group’s ability to engage and influence both internal and external stakeholders, it is learning the problem solving (consulting) process. This is not necessarily a skill that you would quickly identify as required but it is THE difference in moving to Category Management! Next Article Globalization – Are We Headed for a Geo-Political Recession?